Go on — send us a postcard for our postcard wall! 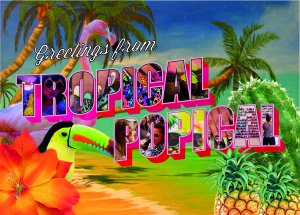 As we love getting stuff in the post so much, we decided to make postcards for you to post from your trip to Tropical Topical – just like a real holiday. They’re €1 and we’ll stamp and post it for you so come with some real life addresses on hand and send something real instead of a text! If you’d like to arrange a special nail soirée with us, drop us a line!